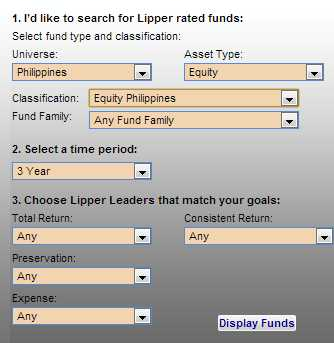 Lipper Leaders is a free online service under the Thomson Reuters brand that lets users screen and sort investment funds (e.g., UITFs and mutual funds) in various markets. In this post, I will take you through Lipper Leaders, how you can use it to choose a fund that best suits you, and some of its limitations. "Universe" pertains to market or country, so for most of us it's the Philippines. Under "Asset Type," we have the common types of investment funds: equity, bond/fixed income, balanced (under "mixed assets"). 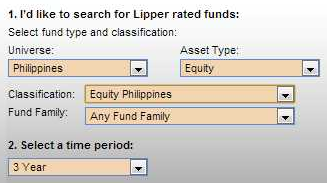 Please note that there are no "alternative" or "commodity" listed funds for the Philippines. "Classification" refers to sub-types under main fund classes, such as different currency denominations for bond funds and geographic reach for equity funds. "Fund Family" lets you choose funds offered by a particular bank. If you're looking for the "best" fund in an asset class, it would be best to leave this as "Any Fund Family." Choices are 10 years, 5 years, 3 years, and Overall. "Overall" means since the introduction of the fund. Since UITFs have only been introduced in 2005 (or thereabouts), you'll only get limited results for "10 years." In choosing a time period, I suggest looking at the results for both "5 years" and "3 years" for consistent top performers. "Lipper Leaders" is just a fancy term for "selection criteria," or fund characteristics that investors should look at in selecting investment funds. 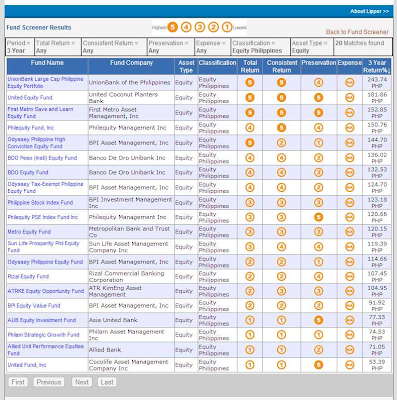 Funds are rated in terms of these Lipper Leaders using a scale of 1 to 5, with 5 being the best for investors. Total Return = the total (accumulated) percentage change in the NAVPU of the fund over your chosen time period. A score of 5 indicates a high Total Return. After configuring the options mentioned above, click "Display Funds" to view the results. The default view is sorted alphabetically by fund name. You can click on any column header to sort by that criteria. Clicking on the "3 Year Return" header, for example, will sort the funds from the lowest to highest return in the chosen period. Clicking it again will sort the funds from highest to lowest, like this. One limitation of the system is that it does not have information for fund costs, so you would have to get the information manually from monthly fund reports. In choosing a fund based on performance, please don't forget to consider costs because they do matter (remember that front/back sales loads are not reflected in the NAVPU). 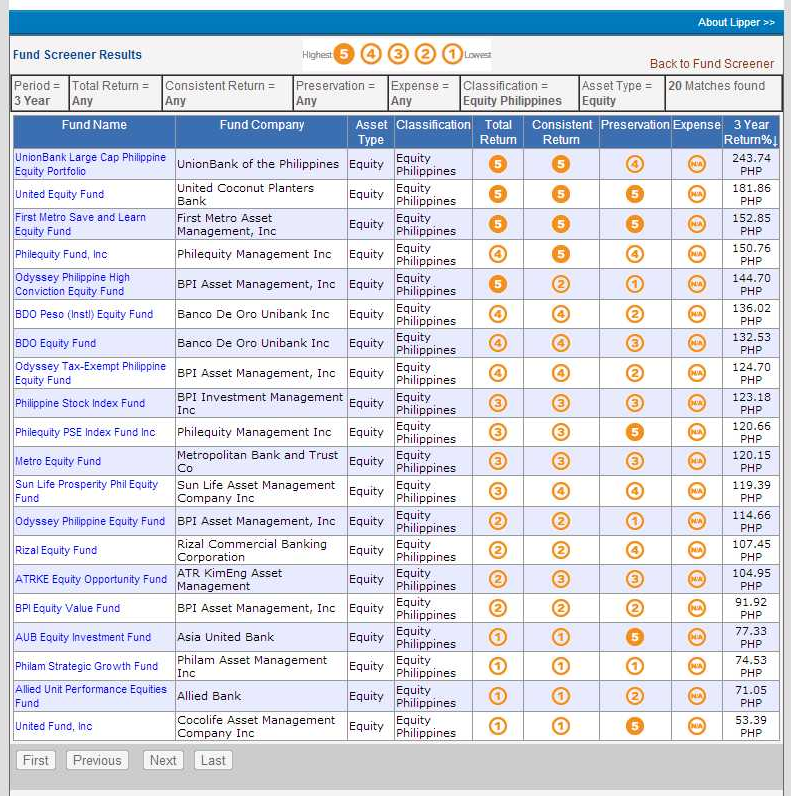 Another feature that I would have loved is the ability to download historical NAVPUs, which are necessary in portfolio construction/asset allocation (UITF.ph is not working anymore, anyone know alternative sources?). Despite these limitations, Lipper Leaders is still a great way to choose funds from the multitude of offerings in the market. I'm sure that in choosing a fund, you may have other considerations than the ones listed above, such as convenience, customer service, or brand strength; still, looking at total returns is a good way to start. JUST REMEMBER: Lipper Leaders screens and sorts funds based on past performance, and past performance is not indicative of future results.